When you work in the field of adoption for more than 25 years, you get to read a lot of adoption-related books. Some books stand the test of time and have such broad application to not only adoptive families but all families. The books that address attachment issues perhaps are the most regarded because attachment is critical to forming healthy relationships. There are two essential types of attachment: parent-child and romantic. To find a set of authors who address the foundational issues in forming healthy attachments in an easy-to-understand manner and from a Christian perspective is a true gift. This gift is brought to you by Milan and Kay Yerkovich. In a non-judgmental tone, this husband and wife team address what they call “Love Styles” in two books, How We Love, which addresses the marital relationship; and How We Love Our Kids, which addresses parenting. The books are truly companions because the Yerkoviches guide the readers to look at their own childhood issues and how their pasts are affecting their marriage relationship as well as their parenting style. We adoption professionals believe there is a certain type of parenting style that must be employed when raising an adopted child—especially a child who has experienced trauma. Many of the principles used to parent such a child can and should be used in parenting any child. The Yerkoviches ask the reader to do some of the hard work of looking inward and to make changes to bring about positive changes in the relationships with their partner and children. The Yerkoviches use terms that are familiar to those who understand attachment parlance—only with a twist. So instead of attachment style, they refer to one’s “love style.” They also list various styles of attachment but use different terms that some may find friendlier and easier to understand. The authors gently bring the Gospel into the conversation—not with a Sunday school lesson dropped over secular research. Instead, they require the partner or parent to look inward and upward as a means of becoming aware of the negative and protective traits we carry into important relationships as adults. This needs to be part of the reader’s sanctification process for true healing to take place. Not only do the Yerkoviches write compelling books, they also provide free of charge an online attachment assessment what they call a Love Style Quiz . While there is only one scientifically validated attachment assessment called the Adult Attachment Inventory (AAI) that can cost a client anywhere from $100 to $1,000, this quiz appears to be reliable as it asks some key questions leading to seemingly insightful results. There is even a chart to see what happens when one partner has one love style and the other spouse another. Some of us at Nightlight whose attachment styles were evaluated using the AAI have also gone online and taken the Lovey Style Quiz. We found the results remarkably close to the AAI. In addition, we suggest you take time to listen to one of the best of 2018’s broadcasts on Focus on the Family “Exploring Your Love Style” by the Yerkoviches. Many highly regarded marriage and family professionals endorse the Yerkoviches’ books and resources. Take the time to explore more of the How We Love information and products. 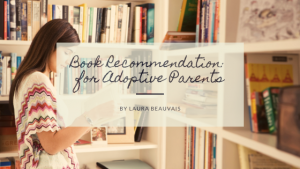 As someone interested in adoption, make sure these compelling books enter your library. All the chocolate has been consumed. All the flowers purchased and delivered. All the cards and kind messages relayed to loved ones. As February is drawing to an end, what better time to reflect on what it looks like to love others well in the coming year. As adoptive parents, you often have special people to love that would not have otherwise crossed your paths if it weren’t for adoption. Whether you are still waiting to meet your child’s birth mother or whether you’re walking through life with her already, here are some practical ways you can actively and genuinely love the women in your lives that made the sacrificial choice of adoption and, thus, have become a special part of your family. Pray. Pray daily for your child’s birth mother. Pray that she would grow in wisdom. Pray that she would know God’s presence and be comforted by His great love for her. Pray that she would be strengthened by His spirit and that any shame or guilt would be laid to rest through Christ’s love and fondness for her. Set aside a special time each day—maybe the hour your child was born or the hour you first met your child’s birth mother—to specifically and earnestly pray for her. Give. Give your time, especially. Give a listening ear. Give a photo when you promised to send one. Give a special gift on certain days throughout the year. Give validation where it is needed. Birth mothers experience a variety of different thoughts and emotions that are often hard for them to process and express. Validate her fears when they are expressed to you. Validate her sadness and grief. Validate her efforts to remain connected with your child. Validate her value and worth as an individual. Validate her gifts and talents as they become evident to you. Pay attention. 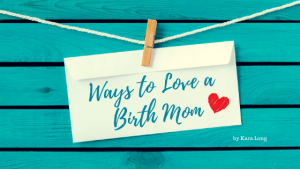 Whether you already know your child’s birth mother or are just beginning to get to know her, take time to understand what makes her feel loved, valued, respected, and cherished. Does she respond well to words of affirmation or prefer receiving gifts? Does she enjoy spending quality time or appreciate acts of service? Be attentive to her needs as an individual and seek to meet them in notable ways. Write a note to her detailing what you love or value about her. Send a bouquet of flowers to her unexpectedly one day. Speak to her as a friend. Really pay attention to what she says and value the opportunity to learn from her. Do what you say you’re going to do. Birth mothers have often had people in their lives make promises that are left unfulfilled. You can imagine how wounding that can be over time. Overcommitting can often lead to even more heartbreak, grief, and rejection for birth mothers. That is why it is absolutely crucial to avoid overcommitting and only say what you’re actually willing to do. Let your yes be your yes, and your no be your no. If you say you’ll send pictures, send them as you promised. If you agreed to meet up before the birth, make time to meet her! If you told her you would write a letter a few times a year, make sure the letters make it to her. Empathize. Social researcher, Dr. Brené Brown, made an important distinction when saying that empathy fuels connection, whereas sympathy drives disconnection. Connection is always the goal—for adoptive parents, birth parents, and children. So, when listening to the stories, thoughts, or feelings of these courageous women, try focusing on empathizing—feeling with them rather feeling sorry for them. For more on the distinction Dr. Brown makes and why empathy holds so much more power when connecting with not just birth mothers, but also others with whom we interact each day, I would encourage you to watch this short video. Sessions will be recorded and available to watch later on the Equipping Minds Youtube channel and Facebook page. Host a group at your home, church, or school.We will be playing games to build cognitive, social, emotional, sensory, and motor skills. These games are used to find the specific areas in which the brain struggles such as working memory, processing speed, perceptual reasoning, and comprehension. Parents, teachers, and therapists are implementing at home, in the classroom, and in their centers improving reading, math, writing, language, social skills, and behavior. We will have 8 sessions to equip you to work with your own children. What separates Equipping Minds from other programs is its holistic approach. The Equipping Minds program uses nutritional therapy, primitive reflex exercises, sound therapy, vestibular therapy, and vision exercises in addition to Equipping Minds cognitive exercises. Scientists are excited about your brain’s abilities to keep growing, learning, changing,and healing, ALL THROUGH LIFE! Equipping Minds will give you the practical exercises and games to do just that. You will be equipped to build memory, processing, comprehension, language, social, and reasoning skills in learners of all ages and abilities. It is based on a biblical view of human development that believes the brain can change. Equipping Minds also differs from other programs, in that, these brain strengthening exercises use what the student already knows. Equipping Minds ingeniously sets aside academic skills allowing us to get to the foundational roots and cognitive functions, quickly and accurately. Working memory and processing speed are two of the most common weaknesses we see in students with learning challenges. They often get labeled with ADHD, dyslexia, and other learning disorders when what they really need is a holistic approach to address the neurodevelopmental and cognitive foundations. I am excited to see how God will use this course. Please share with those you feel would benefit. Dr. Carol Brown has over 35 years of experience as a principal, teacher, cognitive developmental therapist, social worker, reading and learning specialist, speaker, HSLDA special needs consultant, and mother. Carol has completed her Doctor of Education (Ed.D) from the Southern Baptist Theological Seminary. She received her M.A. in Social Services from Southwestern Seminary and B.A. in Rehabilitation Counseling from Marshall University. She is a contributing author in the book, Neuroscience and Christian Formation, Human Development: Equipping Minds with Cognitive Development , and the Equipping Minds Cognitive Development Curriculum. 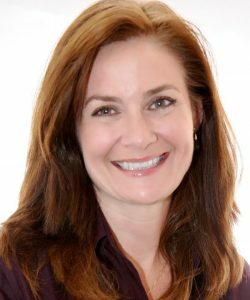 She has served as a learning specialist, teacher, principal, and head of school in classical Christian schools in North Carolina, Georgia, Northern Virginia, and Lyon, France. 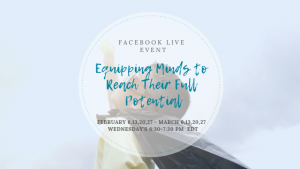 Carol trains public, private, and homeschool educators in the Equipping Minds Cognitive Development Curriculum which she created. She has conducted professional development workshops for Kentucky Association of School Councils (KASC), Toyota, University of Kentucky College of Medicine, Kentucky Parks and Recreation, Kentucky Department of Vocational Rehabilitation, Centre College,Society of Professors in Christian Education (SPCE), National Alliance on Mental Illness ( NAMI), homeschool conferences, and civic organizations. The holidays are a joyous time of year. But unless gift gifting is your love language, finding gifts for everyone on your Christmas list can cause some extra stress! Here are some recommendations on how you can bless the foster or foster adoptive child or parent in your life this Christmas season. Finding respite care for children in foster care, or feeling comfortable leaving your children with a stranger, is a hard thing for a foster parent. A “date night” in could be the perfect compromise for your foster family. You could include toys or activities for the children, board games or crafts, and gift the parents a movie and popcorn. Offering to provide in-home babysitting while they have their date night is an extra bonus! As your family grows, it can get expensive to eat out. But many foster children have not experienced dinners at a sit-down restaurant, so this would provide an extra special treat for the family. It also provides the parents a break from cooking! Photo books can be very special for foster children who may not have any pictures of themselves as babies or toddlers. 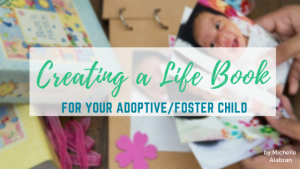 Many foster parents create Lifebooks, a recording of the child’s memories, past and present, that are preserved in a binder, photo album, or book. This is a gift that can stay with the foster child if they return home. Or photo frames the parents can hang on the wall will help a child feel part of the family and provide a sense of extra comfort. Items that provide relaxation for the foster parents is always appreciated. It could be a journal, candles, bath salts, a gift certificate for a massage, or a good book. Many children in foster care struggle with sensory integration or the processing and organizing of sensory information from the senses. When a child struggles with sensory integration, they can have a hard time interpreting sensory information. Sensory tools such as a weighted blanket, fidgets, balance disks, etc. can be extremely helpful for a child! Handmade gift certificates for a month of weekly homemade meals, offers to provide babysitting, or yard care can go a long way, especially for working foster parents. Dream Makers –Every year, 26,000 teens age out of the foster care system without a family to call their own. Many are left without a loving support system or resources to help them reach their full potential. Dream Makers allows you to meet the needs and dreams of these youth as they enter into adulthood. Requests have included laptops for college, emergency funds, funds for driver’s education classes, and much more. Learn more here: https://dreammakersproject.org/ . As most families and agencies would say, Dr. Karyn Purvis, who lost her valiant battle with cancer on April 12, 2016, has been one of the most influential teachers for adoptive families. There are few conversations I have with adoptive families where I do not reference her words, wisdom, and expertise. “Be gentle”, “Are you asking or telling?”, and “Use your words” are so ingrained in me that they come out to just about any child (or adult) that I come across, in my adoption world or not. As a TBRI Educator, I was beyond blessed to sit and learn from Dr. Purvis at their intensive training, countless conferences, and Empowered to Connect before her passing. Each time I read her words, whether in the book The Connected Child or notes from past trainings, her lessons sink deeper, and I hope that I can turn to our clients and impart even a fraction of her wisdom as they care for their children from hard places. 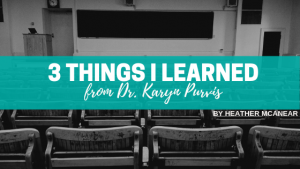 I took some time to reflect on all that I learned from Dr. Purvis and want to share those words with you today. Dr. Purvis’s instruction on evaluating adult attachment has not only been instrumental in my own personal journey, but is crucial for adoptive families to explore. As we consider taking children into our homes that have experienced trauma, we must give space and time to our own healing journey. These children are likely to trigger our own past wounds, no matter how big or small, and as the quote says above, we must lead the way into healing. I took a flight a few days ago where I was struck again by the instructions to place the oxygen mask on yourself first before helping a child. The idea here is that you cannot help a child if you are passed out or harmed yourself by the lack of oxygen. If oxygen is flowing to you, you can quickly come to the aid of a child, calming them down and providing the oxygen they need to survive. The same principle applies to our own healing journeys. You cannot help a child if you are preoccupied with your own needs. You cannot guide a child toward healing if you don’t know what a healthy, secure person looks like for yourself. How do you know where to lead them? How do you teach them secure relationships if you are not secure yourself? Do you struggle with any of these areas? I can give care very easily but receiving that care from another person is quite difficult. Parents must be honest with themselves about their own childhood experiences and how that impacts you as an adult. Take some time to give real consideration to the list above that describe a securely attached adult. Which of these areas do you struggle with in your romantic, family, and friend relationships? If you struggle to receive care, you won’t be able to receive the love your child wants to extend to you. If you don’t know how to negotiate your needs, you will lean toward anger or distrust in your relationships. Perhaps you don’t trust that someone will meet your needs if you say them out loud, so you stay silent and grow resentful. I encourage you to be honest with yourself and give grace and kindness to the areas where you struggle. This will make you better in all of your relationships, especially with your adopted child. When you learn to give love in a healthier way, your child learns to receive real love. If you can learn to be autonomous your child learns to trust others and trust themselves. Seek out the perspective of a counselor, pastor, friend, or spouse to identify the reasons you struggle with any of these areas. Journal, pray, and bring it to God to start your own healing journey to mark the path for your child to follow. I have heard people speak of going into orphanages in Eastern Europe, filled with babies and toddlers, and describe the eerie silence. Is that what you would expect to hear from a room full of 2 year olds? What was discovered is that neglected children will stop crying once they learn that their cries are not attended to. If no one will respond and connect with you when you cry out, why take the time to cry out and feel that repeated rejection? Crying is a way of expressing a need, especially for a child that is not old enough to put their needs into words. If they experience neglect or abuse as a young child, they begin to feel as if they do not have a voice. As I mentioned above, learning to negotiate your needs requires an environment where you feel safe to express your needs and trust that you and your needs will be valued by a response. This cycle starts for us when as infants. You cried when you were hungry, your mother heard your cries, and fed you. This creates a cycle of trust, value, and love. Our children from hard places often have that cycle disrupted which solidifies the message that their needs are not important and no one will respond with care for them. As they grow, they stop speaking out their needs and develop strategies to meet their own needs. This often manifests in negative behaviors such as lying, stealing, manipulation, or aggression. “Use your words” is one of my favorite catch phrases from Dr. Purvis because it teaches children to ask for what they need instead of using tantrums, lying, or acting out to communicate. It reinforces that their words, over negative behaviors, have power to get their needs met. They don’t need to hoard food if they learn they can ask for a snack and food will be provided to them. They don’t need to steal toys from their siblings if they learn they can ask to play with them. Dr. Purvis encourages families to learn how to say “yes” over always saying “no”. This does not mean you become a pushover that spoils your child. You can learn to say yes to your child, even while technically saying no. For example, let’s say your child wants to watch a TV show or play with a particular toy but you are in a situation where they cannot do that in that moment. Instead of saying “no, we don’t have time for that” you can instead say, “right now we are doing this activity but tonight after dinner you can watch that TV show”. This message still keeps you on track for what you are doing in that moment while also telling the child that you heard their need (or want) and will meet that need, just not in that exact moment. Think over the last few days and all the times you said “no” to your child. Sometimes you must say “no” in situations where they are trying to run into the street or touching something that could harm them. However, I bet there are at least a few things that could be easily rephrased to turn your “no” into a “yes” and reinforce connection, trust, and security between you and your child. We take in the world around us through our senses – taste, smell, see, hear, and touch. We will add to this list common list the senses of proprioceptive (deep tactile pressure) and vestibular (balance, body in relation to the earth). Our senses help us take in input from our environment, organize that input, and send us a message. For example, if we smell something burning, our brain very quickly processes that smell by telling us what the smell is (burning food or burning materials) and tells our body how to respond (look for fire in the house, run away from danger, stay calm because it is just a campfire, etc). When our children have a breakdown in processing, their brain is not able to compute the input their senses are giving them as quickly or in the same way are someone with typically functioning sensory processing. For our children from hard places, a disruption in sensory processing often results in frustration, overstimulation, or dysregulation. If your child is oversensitive in one or more of their senses, they are taking in too much information and their brain cannot organize it in a way to keep us calm and understanding. These are children that cannot wear certain fabrics in their clothing because the feeling on their body is overstimulating. They may not be able to say to you this issue is occurring but if their brain is preoccupied with the feel of their clothes, they are not able to compartmentalize that input and are unable to focus in school or at the dinner table. They may be too easily startled by loud noises and their brain is not able to calm them down as quickly or interpret any loud noise they hear as a threat. Other children may be under stimulated by sensory input and need stronger or more intense input in order to organize their world and thoughts. Children that have experienced any of the 6 risk factors that Dr. Purvis outlines are at risk of Sensory Processing Disorder. These children will often display these struggles with sensory input in their behavior and parents should keep watch this. Perhaps your child is aggressive when others come too close, shriek when their hair is brushed, or refuse to participate in certain activities. If your child has a complete meltdown when eating certain textures of food or certain articles of clothing, this could be misbehavior, but it likely indicates an issue with sensory processing. Keep a log of your child’s odd or problematic behavior to see if there are patterns. Perhaps your child always has aggressive behavior after you come home from a crowded activity (party, church, grocery store, shopping, etc). This could indicate your child was overstimulated by the noise or bumping into others and their brain is not able to calm them down like it should once they are away from the overstimulation. Give your child lots of sensory rich activities each day. This will help them meet their sensory needs and teach their brain to sense, organize, and respond to sensory input. You can search online for sensory activities you can do at home with your child. Have your child evaluated for Sensory Processing Disorder by an Occupational Therapist. They will do an evaluation and treatment plan to help your child learn to regulate and get sensory needs met. These three lessons are simple concepts but take a lot of intention and practice for you as a parent. Contact us at the Post Adoption Connection Center to learn more about how to integrate these concepts into your parenting, especially if you are experiencing difficulties with your child. Adoption Support: What Is Helpful from Family and Friends? So… you are parents and you’re in your home loving on your baby. Friends and family are excited and want to celebrate with you, however, they may not quite know how to support you during this time. They may wonder if it’s okay to stop by, deliver a meal or offer to babysit. They may have additional questions as to what you need. While I’m an advocate of telling people what you need, not all people hear when there’s a baby involved! 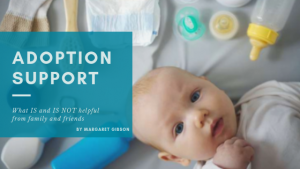 Let’s look at a few ways family and friends can support you while you bond and spend time snuggling with your little one. DO accept our decision to adopt without question and how we choose to share about our personal life and decisions. DO accept our choice of a child regardless of their race, heritage or age. DO offer practical help if you don’t mind giving us your time. DO respect that we need bonding time with our child. DO respect our parenting style. DO speak of the birth family with favorable words – We want to honor them with our words and our actions. Speaking negatively of our child(ren)’s biology can transfer to them. DO be willing to learn and educate yourself about adoption. DO show our child unconditional love. DON’T feel sorry for our adopted child. DON’T tell us that now that we’ve adopted we’ll get pregnant with a child of “our own”. DON’T make demands for our time and attention during our adjustment to this new phase. One adoptive mother’s story: When we brought our child home (directly from the hospital) we had very few items. We struggled for years with infertility and it was too painful to have baby items in our home. Our child was born a month early (we had no idea of gender prior to birth) so we stopped at Babies R Us (while traveling home) to get what we needed. Upon arriving home, I borrowed from friends (bottles and necessary items) to get through until a baby shower was planned. I think everyone thought we must have everything that we needed (despite being registered at Babies R Us!) because at the baby shower we received only clothes and small items. In addition, not one person brought us a meal or offered to help out in any other way. I also didn’t get paid maternity leave! We were not angry, we never expected anything from anyone, but I was hurt. For years I had been supportive, excited, and giving (of time and resources) when my friends welcomed their children into the world. In fact, when I confided in one friend about how sleep deprived I was she stated “well, isn’t this what you wanted?”. This was what I wanted, but I was tired! Everyone thought I should spring right in to motherhood, but I didn’t. I was struggling terribly (with what later was pointed out to me, by an adoption worker, as post adoption blues). I didn’t feel worthy of being my baby’s mom. I would stay awake at night wondering if his birth mother was hurting, missing him. I wondered if he missed her. If I would ever be good enough. I was sad, confused, and felt guilty during what should have been one of the happiest times of my life. So… support me, on my terms. 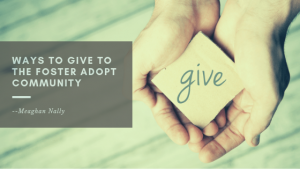 Let’s work together to help those in the adoption community as they begin this wonderful stage of the journey! Be aware, and be sensitive/understanding and look for ways you can help, so that these new parents feel empowered and prepared to welcome home their new little one. There are many different approaches to take when educating teachers and advocating for our foster children. If we share too much, will teachers make assumptions? If we don’t share enough, teachers might not be able to help our child flourish. Some parents feel it is best to share as little as possible. Many times, teachers who are not trauma informed hear they have a foster child in the classroom and suddenly our child becomes the classroom scapegoat. Minor issues—issues every child has—suddenly turn in to “red flags” and, more often than not, expectations are lowered to unreasonable standards. On the other hand, some parents feel it is best to share as much as possible because knowledge is power. Educating your child’s teacher, telling their story, may help the teacher understand your child’s moods and behaviors in the classroom setting. When we know the “why” behind behaviors they can be addressed in a way that helps create new pathways leading to long lasting behavior change. We know that parenting, and sharing, is not black and white. Therefore, let’s find balance in the gray area, as we strive to share on a need to know basis. Working together as a team, both at home and in the classroom, creates a sense of “Felt Safety” for our child. It is helpful for teachers to know what triggers to watch for, and what intervention works best, when our child is triggered. Sharing on a need to know basis allows for understanding, for example—“Thursdays are rough because of visits on Wednesdays”. It is not necessary for teachers to know private details of the birth parents, the case, or how the child came to live with you. 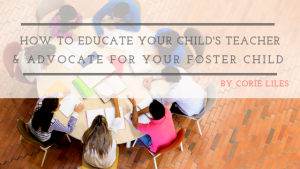 Sharing on a need to know basis allows the teacher to have enough information to support your foster child, while simultaneously ensuring that we respect the details of a story that is not ours to share. 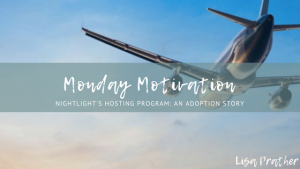 Did you know that Nightlight was the very first adoption agency to do hosting? In the early 90’s Nightlight brought over a tour group of older children from Russia. Today’s Feel Good Friday story is brought to you by hosting. Over Christmas 2009, I was working in the South Carolina office and we were assisting a hosting agency to bring over a group of children from Ukraine. While the children were in the air between Ukraine and the US, one of the family’s backed out of hosting. I sent out an urgent e-mail to families who had inquired with us. One family sent the e-mail to the youth pastor at their church. Bucky and Julie Rogers were youth pastors at the time, and they had previously adopted two children (one child through domestic adoption and one child from Guatemala). They had only adopted babies and had no intention of adopting an older child. However, because they were youth pastors, they figured they could do a good job hosting. Sasha was 13 years old at that time. He arrived and won all of our hearts. I remember even the van driver (bringing the children from the airport) told me that he was her favorite of the group. Within 2 days, Bucky and Julie called and wanted to know exactly what they needed to do to adopt Sasha. Fast forward to travel, Mount Eyjafjallajökull erupted bringing air travel over Europe to a halt. This happened the very day that Bucky and Julie were scheduled to fly to Ukraine. They rebooked their flight to Germany and the gate agent told them that he could not guarantee that once they got to Germany they would be able to get to Ukraine. Julie told the gate agent, “If you get me to Germany, I’ll find a way to get to my son! 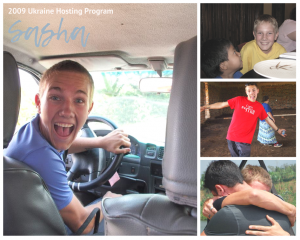 Sasha has grown into such a loving, respectful, young man who loves Jesus and his family. 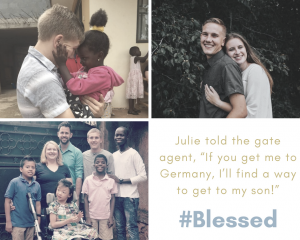 Bucky and Julie are now full time missionaries in Uganda, and Sasha has spent a lot of time there as well. Sasha is now 21 years old and getting married this fall. A few weeks ago, Sasha sent me a message on Facebook asking for my home address. I said, “Is it time for wedding invitations?” and he responded that it was. I am so thrilled to be invited to witness this young man’s wedding. He has been a blessing to all of us since his arrival here, and I am so humbled that God used me in a small way to change his story. I am also especially overwhelmed by the fact that this is the first child that I have helped in the adoption process who is now old enough to get married. I guess that means there are more to come. I’m getting up there. Hosting programs are a lot of work and sometimes stressful, but there are so many more children just like Sasha who would not have found a family otherwise. This is why we do hosting and why we do what we do each day! For more information about our Hosting Programs, please contact Natalie by emailing her at natalie@nightlight.org. Chinese New Year is upon us! February 16th marks the beginning of the Chinese New Year celebrations around the world for 2018. If you are not familiar with Chinese New Year it is an annual festival that’s not only celebrated in China but also by many other nationalities. Some celebrations last as long as 15 days so we wanted to share some special ways to observe this special holiday with your family. Chinese New Year can be especially meaningful for families who have adopted children from China. It is so vital that adoptive parents find ways to embrace the culture of their home country and celebrate their child’s rich heritage within their home. 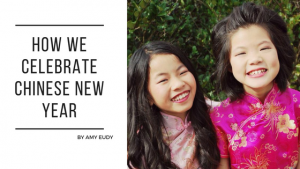 In order to research some of the best ways to participate in Chinese New Year festivities, I turned to some of our adoptive families to get ideas of special ways they have enjoyed celebrating this time of year with their children. One adoptive mom, Anne, shared that their church has a big annual Chinese New Year celebration. Many of the people who come wear special Chinese outfits. They decorate the fellowship hall in red and yellow-gold. At last year’s celebration one of the Chinese men in the church made over 700 homemade dumplings! They have a potluck meal in which anyone in the community that wants to come is welcome to come and join in the festivities. She shared the picture below of their special gathering and I could not help but be moved by the beautiful smiles of so many individuals and families who set aside this time to celebrate the rich foods and customs of this Chinese holiday together. I can’t help but think of each child represented and the memories that they will carry with them for the rest of their lives about how special these gatherings were. Anne also recommended this book, Bringing in the New Year by Grace Lin about a Chinese American family as they prepare for the Lunar New Year. In the book each member of the family lends a hand as they sweep out the dust of the old year, hang decorations, and make dumplings. Then it’s time to put on new clothes and celebrate with family and friends. The book beautifully illustrates the fireworks, lion dancers, shining lanterns, and a dragon parade to help bring in the Lunar New Year. 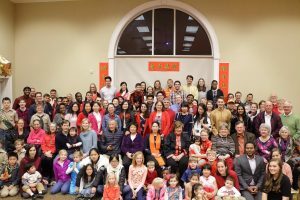 Another adoptive mom, Penny, shared traditions that they have developed to celebrate Chinese New Year since welcoming three precious children from China into their family. Each year their family sets aside a day to make lanterns to hang around their home. Construction paper or decorated scrapbook paper can be used to make these beautiful and festive lanterns. Here is a link that gives instructions for making lanterns and this is a craft that will be fun for all ages. Two of Penny’s daughters are pictured below in their traditional silk dresses. We always recommend families picking out traditional Chinese clothes when they travel to China for their adoptions and purchase clothes in various sizes for their children to enjoy as they grow! Having dresses such as these to wear for Chinese New Year celebrations (or any time they wish!) can be such a special gift for adopted children. 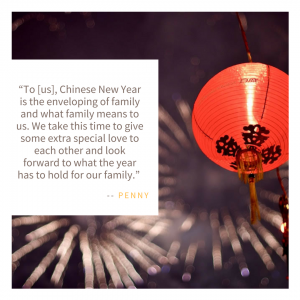 In addition, when their kids were younger Penny would go to their classes and read a Chinese New Year book to give her children’s classmates information about the history and customs that make this holiday so special for Chinese families. Here is a link for some great books that teach small children about this special holiday. I was so impressed to hear from an adoptive mom who wanted to share about one way they are celebrating Chinese New year for the first time after recently bringing their son, Langston, home from China. One custom that Brandy found that they could incorporate was that of hong bao which is an iconic symbol of Chinese New Year. A Chinese red envelope is simply an ornate red pocket of paper the size of an index card that holds money and it’s customary to leave the red envelope with two tangerines by a child’s bedside on New Year’s Eve. Brandy shared that they we worked on making red envelopes to put money in for Langston’s classmates (they shared $1). Langston was so excited about making these special envelopes and about sharing this custom with his new friends. 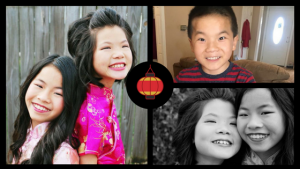 Another adoptive mom, Amanda, shared that they are hosting their own Chinese New Year celebration at their house for several other families that they know who have also adopted from China. They are having Chinese takeout, doing crafts with the kids with red envelopes, and have planned for some other activities that pertain to Chinese culture. If you know of other families in your community that would want to celebrate with you but are not sure about preparing a huge meal yourself then why not invite each family to bring one dish from a local Chinese restaurant? What a fantastic (and affordable!) way to celebrate with other families in your community! If you have some helpful articles or ideas you would like to share on this topic, please submit in the comments below!